The key insight to understanding high-end disruption is that innovation improves products either by increasing performance or by increasing affordability. 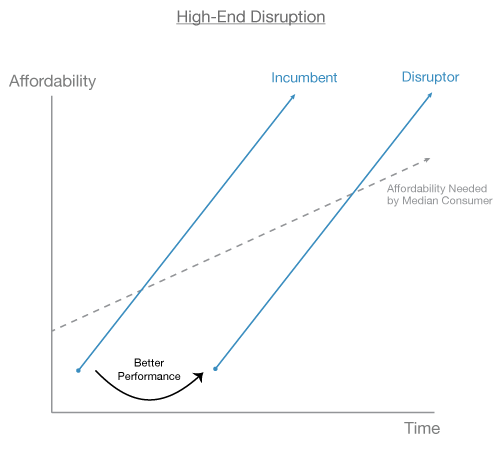 While low-end disruption occurs through improvements in performance, high-end disruption occurs through improvements in affordability. While incumbents chase profit margins in low-end disruption, incumbents chase market volume in high-end disruption. In both cases, incumbents are acting rationally by improving their profitability through sustaining innovations — at least at first. Christensen’s low-end framework can be modified to visualize high-end disruption by changing the vertical axis from performance to affordability. In low-end disruption, consumers are price-choosers and performance-takers. While in high-end disruption, consumers are performance-choosers and price-takers. Low- and high-end disruption are idealized special cases of a general phenomenon of disruptive innovation. · Use that money to build an affordable car. · Use that money to build an even more affordable car. The purpose of this article is to present a case for disruptive innovation from high-end products. This article is intended for readers who are already familiar with the classic theory of low-end disruption as described by Clay Christensen. Intuitively, we know that industries can be disrupted with (what are initially) high-end products. For example, iPods were a high-end disruptor to CD players, and iPhones were then a high-end disruptor to iPods (among many other things). And there are countless other examples (see the end of this post). In these cases, incumbents were displaced by disrupting entrants, despite the strength, market power and resources of the incumbent. However, the classical theory of disruptive innovation developed by Clay Christensen only explains disruptive innovation from the view of low-performing products. We need a way to approach disruptive innovation from the view of high-performing products. To understand high-end disruption, we must first take note of a stylized fact: Innovation improves a product by either improving performance or by improving affordability. There is, of course, a direct relationship between product performance and price, but innovation does not imply better performance, necessarily. Instead, innovation can also manifest in the form of a lower price. This distinction is the key insight to understanding high-end disruption: Whereas low-end disruptors enter the market with a low-performing, low-price product and then work to improve performance, high-end disruptors enter the market with a high-performing, high-price product and then work to improve price. In each case, the entrant eventually takes over the entire market with a high-performing, low-price product. We can adjust the Christensen low-end disruption framework to visualize high-end disruption simply by changing the measure of innovation from performance to affordability. If you are already familiar with the Christensen low-end disruption framework, everything is straightforward once you make this change. 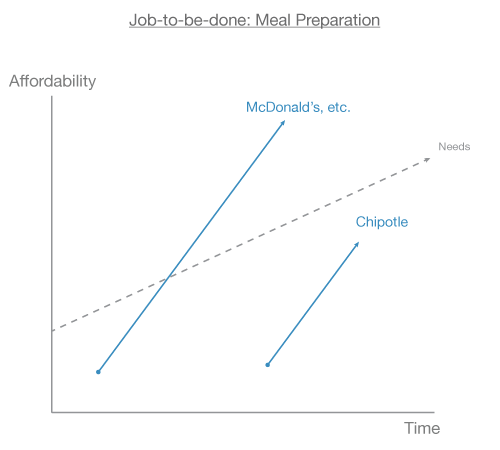 Similar to the performance needs distribution, consumers will fall into the affordability needs distribution. In the Christensen low-end case, the left-tail of the performance needs distribution comprises consumers that value affordability and are willing to pay for it with low performance. 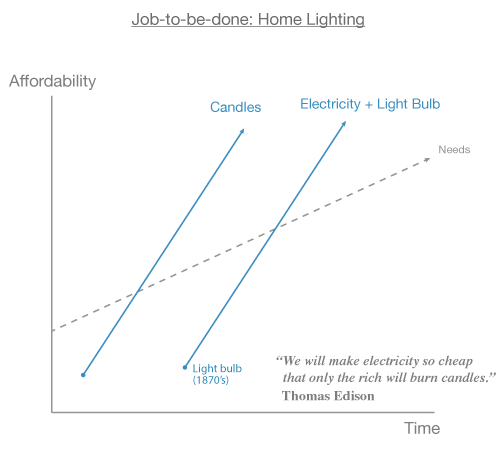 In the high-end case, however, the left-tail of the affordability needs distribution comprises consumers that value high performance and are willing to pay for it with low affordability. In both cases, the entrants are competing against non-consumption — although under-consumption may be a better term for the high-end consumers. In Christensen’s low-end theory, low-end disruptors enter the market with a product that is low-performing but highly affordable. Low-end entrants initially under-serve the performance needs of the majority of the market, but are good enough for the low-end which values affordability. Established incumbents are under-serving the low-end of the market because it is simply not attractive in terms of profit margin. For the entrant, however, the profit margin of the low-end market is attractive. Entering the market with an already highly affordable product, low-end entrants move up the market by increasing performance through sustaining innovations. As low-end entrants improve performance, their product becomes good enough for more and more of the market, eventually over-taking the entire market. As Christensen describes, established incumbents are unable or unwilling to adopt the new disruptive technology because they are incentivized against competing with low-end entrants, and instead move further up the market towards higher performance in order to attain higher profit margins. Incumbents facing low-end disruption are seemingly acting entirely rational by ceding the lower-end of the market, since achieving higher profit margins through sustaining innovation boosts profitability — at least at first, and until it doesn’t, when it is too late to pivot to the disruptive innovation. On the other hand, high-end disruptors enter the market with a product that is low in affordability but high-performing. High-end entrants initially under-serve the affordability needs of the majority of the market, but are cheap enough for the high-end which values performance. Often times, this niche high-end market is comprised of hobbyists and enthusiasts — although not always. Established incumbents are under-serving the high-end of the market because it is simply not attractive in terms of volume. 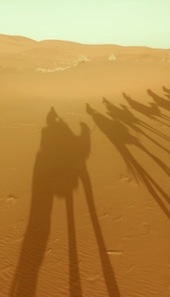 For the entrant, however, the potential volume of the high-end market is attractive. Entering the market with an already high-performing product, high-end entrants move down the market by increasing affordability through sustaining innovations. As high-end entrants improve affordability, their product becomes cheap enough for more and more of the market, eventually over-taking the entire market. Established incumbents are unable or unwilling to adopt the new disruptive technology because they are incentivized against competing with high-end entrants, and instead move down the market towards higher affordability in order to attain higher sales volume. Incumbents facing high-end disruption are seemingly acting entirely rational by ceding the higher-end of the market, since chasing sales volume through sustaining innovation boosts profitability — at least at first, and until it doesn’t, when it is too late to pivot to the disruptive innovation. It is important to note that both low-end and high-end disruptors enter the market by serving consumers that are under-consuming given their preference for performance and affordability. Whether starting from the low- or high-end, the disruptor eventually takes over the market with a product that is both better performing and more affordable. High-end disruption could thus also be described as ‘low-affordability disruption’. In low-end disruption, consumers are price-choosers and performance-takers: they choose their desired price level and receive the corresponding performance. In high-end disruption, consumers are performance-choosers and price-takers: they choose their desired level of performance and pay the corresponding price. This distinction between low- and high-end disruption is similar to the distinction between Cournot competition (quantity-choosers/price-takers) and Bertrand competition (price-choosers/quantity-takers) in oligopoly theory. Readers familiar with oligopoly theory will know that both Cournot competition and Bertrand competition are useful for understanding different types of markets in the real world. Bertrand competition is useful for understanding Pepsi and Coca Cola, for example, while Cournot competition is better for understanding cartels such as OPEC. 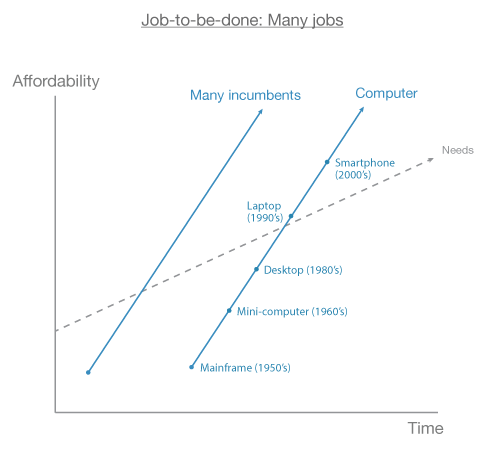 Similarly, low-end disruption and high-end disruption are useful for understanding different types of innovations for different jobs-to-be-done. The famous key phrase for thinking about low-end disruption is good enough, while the key phrase for thinking about high-end disruption is cheap enough. To reiterate: Established incumbents that are being disrupted from the low-end chase profit margins, while incumbents being disrupted from the high-end chase sales volumes. The same incentives that encourage incumbents to move up the market in search of higher profit margins in low-end disruption also encourage incumbents to move down the market in search of larger sales volumes in high-end disruption. In each case, incumbents are (initially) increasing their profitability, until it is too late. And in each case, the entrant is competing against non- or under-consumption in the consumer needs distribution. Let me thus emphasize that low-end disruption and high-end disruption are idealized cases of a general phenomenon of disruption, where price and performance both interact within consumer preferences. 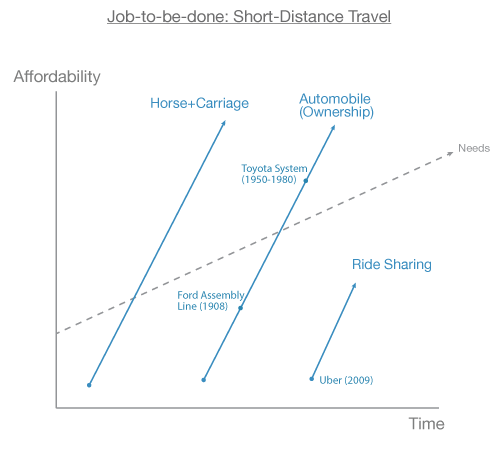 That is to say, we need to synthesize the theories of low-end and high-end disruption. More to come on that in the future. Ben Thomson distinguishes between disruption and obsoletion, and also makes the case that disruption does not apply to personal consumer markets because people have infinite wants — but that’s not right either. Infinite wants simply means that there are infinite jobs-to-be-done, whereas disruption theory only exists in the realm of one job-to-be-done at a time. I think that what Thomson classifies as obsoletion is simply the phenomenon of high-end disruption. 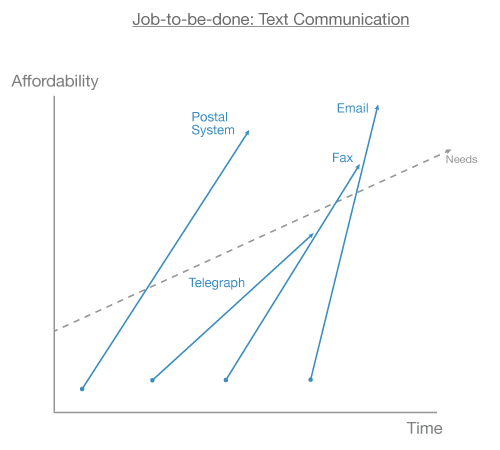 To finish, below I have graphed case examples of high-end disruption for several jobs-to-be-done. If you liked this article, please share, follow me on twitter or subscribe to RSS.